Incumbent London Mayor Boris Johnson promised the Muslim community present at London’s Central Mosque on April 26 that he will increase engagement with them if he is re-elected. He was speaking to the invited imams and representatives of London mosques. A second hustings with another mayoral candidate, Ken Livingstone, was not held as he was busy, according to the organisers. Johnson briefed the audience with his achievements. He said crime in London had gone down, especially on buses and in the underground. “The crime overall is down by 10% in the last four years, murder rate is down by 25%.” The mayor said he was investing in the infrastructure, roads, buses and transport “to make London the best place to live”. He also said he built thousands of affordable homes and will create 200,000 more new jobs for young people. However, most of the questions focused on Muslim issues rather than mainstream London concerns. 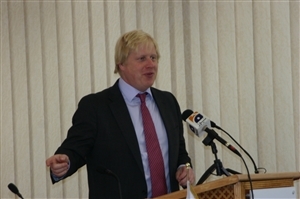 Johnson was asked why he was not engaging with Muslim organisations like the Muslim Council of Britain and Federation of Students Islamic Societies. He replied that he was engaging with the Muslim community by visiting mosques and has spoken at the Eid in the Square. “I hope this session will be seen as the beginning of a process,” in engaging with the wider Muslim community. He added that he had “no intention of disengagement” with the Muslims. Another area of concern was the media misinformation about Muslims and Islamophobic reporting. The mayor said this was “patently unacceptable” and said he should be given examples of such reports.